May 19, 2014 ----- For over 160 years eight North Shore lighthouses have directed vessels to and from the Lakehead thatcontinues today. Thunder Bay a transhipment point between rail, road and our great inland sea, continues to operate, at a somewhat slower pace. From the historic docklands of the East End to the towering grain elevators in the intercity area, Thunder Bay has prospered and developed because of its maritime roots. Enthusiasts might be aware of the local lighthouse lore upon Canada’s greatest inland sea, but the majorities know Superior as an inhospitable place. In fact this country was built, following a charted route to-and-from the Lakehead, which saw immigrants and resources move west and later commodities return. Canadian Lighthouses of Lake Superior is taking the opportunity, while petitioning the government, to provide safe access to North Shore lighthouse, so that visitors may safely visit. The group began two years ago at the public library meeting to discuss ways of saving Trowbridge Lightstation, just off the feet of the Sleeping Giant. Now the group has become incorporated under a new title the CanadianLighthouses of Lake Superior, as a member of the Ontario Historical Society. Recently the group was approved for two leases at Number Ten Lighthouse and Pt. 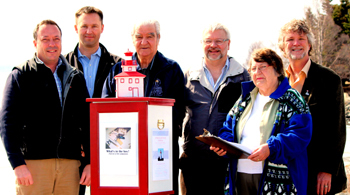 Porphyry Lightstation to run programming to increase public use of the lightstations. The second annual Superior Lighthouse Symposium took place on May 10, 2014 and included three guest speakers. Joanie McGuffin, outdoors enthusiast and paddler extraordinaire, talking about a recent project on the development of a waterbased trail, Darrell Makin, local author, kayaker and lecturer from the School of Outdoor Recreation, Parks and Tourism at Lakehead University, Michèle Proulx, Parks Management Planner Ministry of Natural Resources speaking about local islands habitats and park spaces.